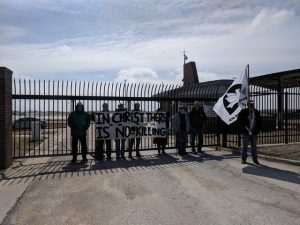 Veterans for Peace and Catholic Workers from across the Midwest converged on the Iowa Air National Guard Drone Command Center in Des Moines on March 17, St. Patrick’s Day at 1 p.m. 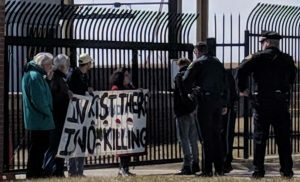 Eight activists were later arrested for blocking the entrance. 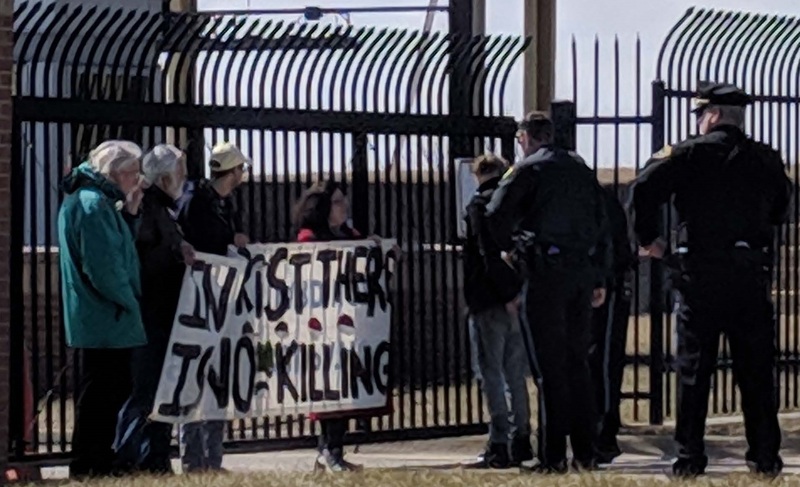 The Midwest Catholic Workers – a loose collection of dozens of autonomous communities spread out in urban shelters, soup kitchens and rural farmsteads across the region – were holding their annual “Faith and Resistance Retreat” March 15-17 in Des Moines. 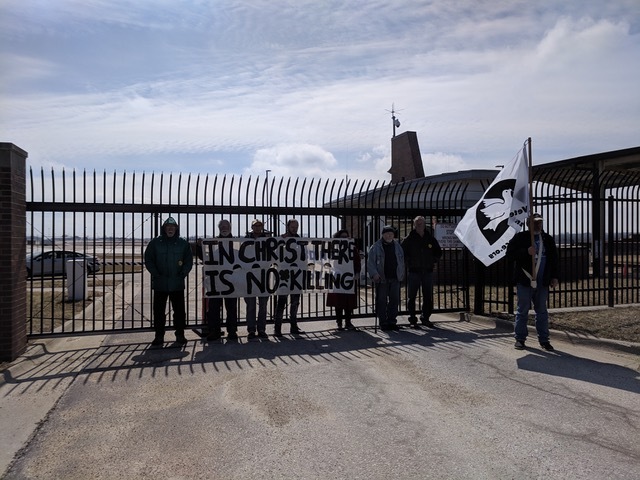 This year’s focus was the two year Des Moines Catholic Worker and Veterans for Peace “Close the Des Moines Drone Command Center” campaign. Sunday’s rally featured speakers Kathy Kelly (three-time Nobel Peace Prize nominee and co-coordinator of Voices for Creative Nonviolence), Sr. Carol Gilbert and Sr. Ardeth Platte (Dominican Sisters, Plowshares activists and Washington, D.C. Catholic Workers), David Logsdon (MN Veterans for Peace and National Veterans for Peace Board Member), Michael Madden (President of Minneapolis Veterans for Peace), Jakob Whitson (Des Moines Catholic Worker) and Gil Landolt (Des Moines Catholic Worker and President of the Bill Basinger Chapter of Des Moines Veterans for Peace). The eight arrested were Steve Jacobs, Columbia, MO Catholic Worker; Mike Miles, Anathoth Catholic Worker Farm, Luck, WI; Gabe McMahan, roaming Catholic Worker currently at Lake City Catholic Worker Farm, WI; and five members of the Des Moines Catholic Workers and Veterans for Peace: Ruth Hart, Ed Bloomer, Jakob Whitson, Al Burney and Frank Cordaro. All eight were taken to the Polk County Jail. Al Burney bailed out. The other seven stayed in jail overnight. They pled guilty before a Jail Judge on Monday morning and were fined between $100 and $1,000 and set free.